Husqvarna Viking Sewing Machines and Sergers. 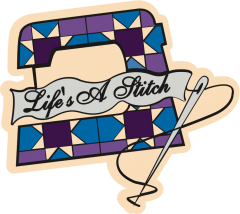 When you buy a machine from Life’s A Stitch, you are getting much more than just a sewing machine. We offer classes, service and follow-up support. Call or drop in any time and one of our friendly staff will happily answer your questions. We carry the full line of Husqvarna Viking Sewing Machines.